How an organism chooses and develops its strategy to react to the coexistence of other organisms in the same communities has long intrigued ecological evolutionary biologists. However, the genetic mechanisms that mediate such ecological processes have not been extensively investigated, thus largely restricting our capacity to link ecological interactions and evolution/speciation. We conflate systems mapping and elements of community ecology into a conceptual framework for mapping competition-cooperation QTLs that determine how different organisms interact socially with each other to drive community dynamics. Complex traits are controlled by numerous unknown genes and physiological and ecological mechanisms. This complexity makes complex traits an extremely difficult subject to study in modern biology. As a statistical geneticist, my task is to untangle the complexity of complex traits by developing powerful statistical mapping theory and tools. My previous experience in long-lived trees stimulated me to introduce developmental processes into genetic mapping in a quest to design marker-assisted early selection strategies aimed at shortening breeding periods. In 2002, my team pioneered functional mapping, a dynamic framework to map the genetic architecture of how QTLs govern end-point phenotypes of complex traits but also the biological processes that cause phenotypic variation. Functional mapping can shed light on our quantitative understanding of how organisms respond to environmental change, how new phenotypes evolve, and which QTLs drive such phenotypic plasticity and evolution, by visualizing the genetic basis of developmental ecological (eco-devo) and developmental evolutionary (evo-devo) processes. In 2006, I was very fortunate to publish an opinion article about functional mapping in Nature Reviews Genetics. It was this article that has enormously encouraged, inspired, and motivated my journey to a broad vision of what are complex traits and how they are formed and evolved. I viewed complex traits as a dynamic system, dissected them into their underlying interconnected components based on morphological, physiological and anatomical rules, and further derived and implemented a system of ordinary differential equations to assemble these components and specify how different components interact and coordinate with each other to determine the end-point phenotypes of complex traits. I married this systems thinking with functional mapping to produce a set of new mapping tools–systems mapping (published in BMC Systems Biology, 2011). The capacity of systems mapping to systematically characterize the pleiotropic control of multiple different but interdependent traits has been well recognized and appreciated by statistical geneticists (Physics of Life Reviews, 2015). In 2013, I got a message from one of my best colleagues and friends at the University of Florida who wanted to submit a grant proposal with me. I browsed NSF’s funding opportunities and found that Dimensions of Biodiversity was the next available program that was most relevant to our research expertise. This program targets the proposals that integrate three dimensions of biodiversity, genetic diversity, taxonomic/phylogenetic diversity, and functional diversity. Although I can pick up the approaches for studying the genetic diversity of experimental or natural populations, I have little experience in investigating taxonomic diversity above the level of the population and, more importantly, have never thought about any functional connection from one gene to other genes (genetic dimension) and from one species to other species (taxonomic dimension) through energy flow, material cycling, and signal transduction. I was bemused and frustrated by my inexperience in these areas. While I was going to tell my friend that I could not make it, my characteristic of persistence and perseverance provokes an opposite voice: You should make it. But, how to make it? The idea of integrating systems mapping and community ecology to advance trait mapping brings me with a delightful mood. Photo by Lidan Sun. A lightning idea cracks from my mind. If I view complex traits as a community, then its underlying components can be regarded as individual interacting species that constitute the community. How one component interacts with others to determine trait phenotype represents a similar biological process in which one species competes for access to resource or cooperates symbiotically with other species in the same community. Community ecology theory links the pattern of species-species competition and cooperation with community dynamics and evolution, and we can use genetic mapping to identify specific QTLs that determine why and how a species chooses to compete or cooperate to maximize its fitness in the community. With these ideas in mind, I started to conflate systems mapping and elements of community ecology to address the fundamental issue of how to integrate genetic, taxonomic and functional dimensions into a unifying framework to meet the requirement of the Dimensions of Biodiversity program. Although the proposal was finally not funded, the unification of systems mapping and community ecology has lightened my thinking about how ecological genetics can be richened and ultimately driven me to walk into a new, ecological road of complex-trait mapping. However, no data were available to support my idea. I sought for collaborators who can produce the data according to my design of experiment that involves the coexistence of different species. Microbiologists, Dr. Xiaoqing He and Dr. Yi Jin, at Beijing Forestry University, expressed a keen interest to collaborate with me and were willing to adventure on what they could not foresee at that time. 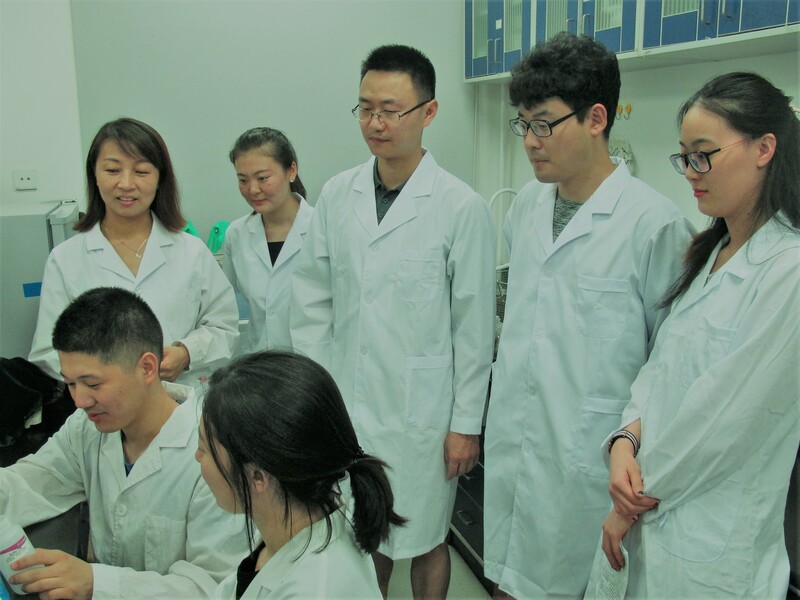 Their research team made enormous efforts to collect strains of two bacterial species, E. coli and S. aureus, culture these strains in both social environment and socially isolated environment, measure the bacterial abundance at a series of time points after culture, and genotype the genomes of these strains. These phenotypic and genotypic data do not only found the material basis of testing my idea, but also fuel my passion, motivation, and spirit of adventure. Dr. He (back row, first from left) and Dr. Jin (back row, third from left) co-lead a research team for conducting bacterial experiments. Photo by Xiaoqing He's group. Dr. Libo Jiang, a statistical geneticist, my former student and now colleague, plays a critical role in deriving statistical algorithms, computing the data, and writing the computer code. 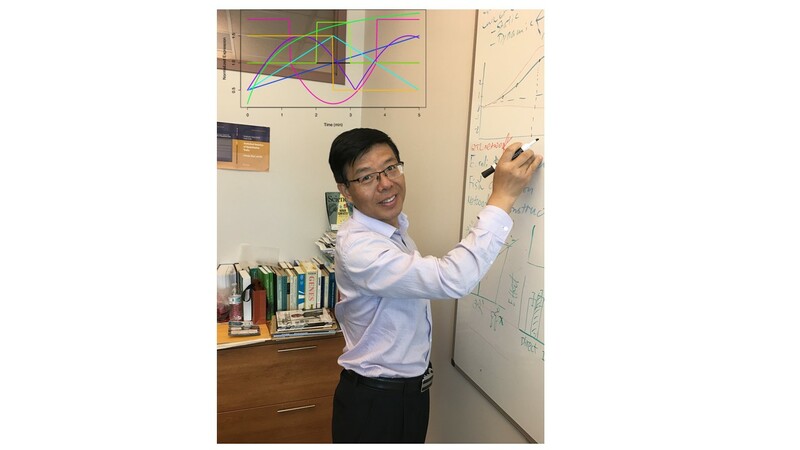 Together with Dr. Meixia Ye, also my former student and now colleague, Libo mathematically derived how the gross abundance of each bacterial species in co-culture is determined by the independent growth of this species and the dependent growth due to its interaction with the other species. The relative contribution of these two growth components reflects the importance of interspecies interactions to community phenotypes. Also, they technically formulated a quantitative genetic model that can calculate the direct effect of a QTL on the phenotype of the species from which the QTL is derived, the indirect effect of the QTL on the phenotype of the interactive species, and the genome-genome epistatic effect of the QTL from different species. 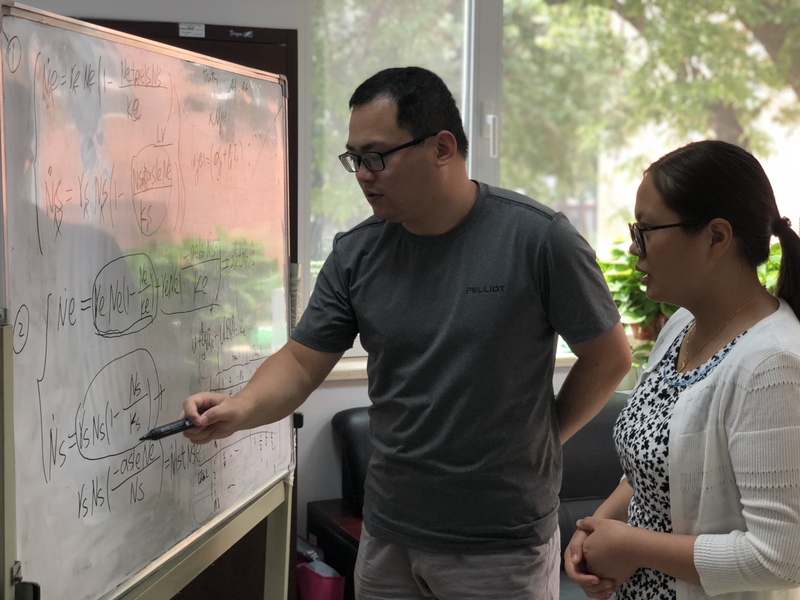 Dr. Jiang (left) and Dr. Ye (right) discussed about Lotka-Volterra equations, a critical link that bridges systems mapping and community ecology. Photo by Dan Liang. Of particular interest in our collaboration was trying to understand what QTLs determine interspecific interactions (through competition and cooperation) and how this ecological genetic process drives community dynamics. As a unifying framework of systems mapping and community ecology, we name this new approach as competition-cooperation mapping (CoCoM).